Der Workshop findet auf Englisch statt. Die deutsche Beschreibung folgt in Kürze. The current international system for protecting intellectual property and its global expansion date back over 100 years: It was shaped and developed in the age of European industrialisation and colonialism. However, copyright issues have become virulent in many countries of the Global South mainly since the 1980s in relation to processes of widespread medialisation and marketisation. Meanwhile China, a country frequently in focus for infringement of IP protection, has only introduced copyright in 1990. Along with increased regulation came increased practices of plagiarism and piracy, but also new demands for protection of cultural heritage and traditional knowledge. On the one hand, creatives and scholars call for better implementation of IP rights to help local artists or to acknowledge tradition-based art as the property of an ethnic group. On the other hand, many criticise the regulations for being incompatible with local practices and norms and for causing more harm than good. Hence, this workshop aims to discuss which challenges and potentials the global legal standards pose for artists and music industries in countries of the Global South. What role do international trade agreements play in these processes of standardisation? How are immaterial cultural goods transformed by local actors who make use of or circumvent the laws? Which norms and regulations existed before the introduction of copyright and in what way do they still co-exist? Moreover, how does the underlying Western concept of individual authorship clash with oral cultures and community-based, collectively-owned art forms? Can folklore and other tradition-based knowledge be protected by copyright? When does the copyrighted marketisation of intangible goods foster new “invented traditions”? And, last but not least: what can we learn from these debates and conflicting norms regarding the complex processes of artistic creation and the question of how to treat and regulate music and copyright more generally? Several participants will give lightning talks on selected issues, but the workshop is designed so that everyone invited has enough time to present their ideas in the discussion. As we invite participants from different countries, the working language will be English. In 2017 and 2018, the Alexander von Humboldt Institute for Internet and Society (HIIG) organises the workshop series Music and Copyright Law in cooperation with the Haus der Kulturen der Welt (HKW) to discuss the most urgent issues around music and copyright law in the digital society. Please note that the workshops are not open for public and address experts in the field of music and law. If you are interested in joining this or another upcoming workshop of the series, please get in touch with Jana Leusing and briefly describe your background and reason for joining the event. 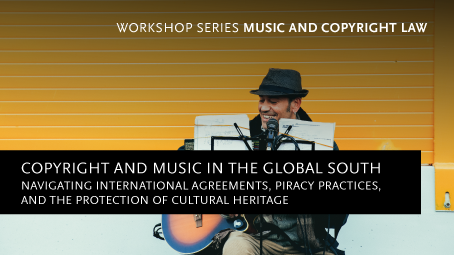 The workshop series Music and Copyright Law takes place at the Alexander von Humboldt Institut for Internet and Society (HIIG), Französische Straße 9, in the room KOSMOS.